I got an 48 mm adapter for attaching the field flattener to my camera. and I also got an adapter for attaching the camera to the telescope via the 1,25" piece. But I cant attach the field flattener to the telescope. If it's what I think it is, it's simpler than you think. See where your #3 screw is (the holder for whatever you insert into the "self centering rear assembly")? Grab the knurled outside of that piece. The whole thing will unscrew from the focuser. Now screw the FF onto the threads it came off of. 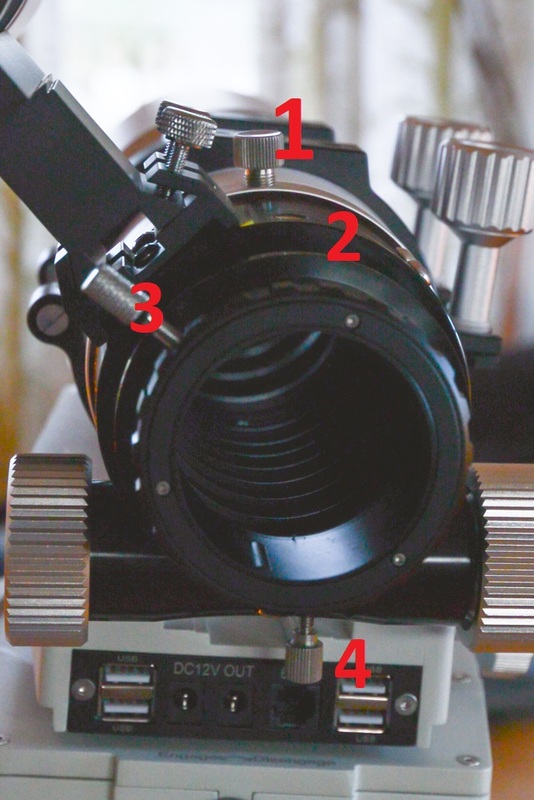 The WO scopes are the same way -- you have to unscrew the 2" holder from the focuser, and the FF goes on in its place. I had to unscrew 3 small screws that is around the edge where the number 2 is on the photo - it is not the 3 small screws the can be seen in front on the photo. The screws the has to be removed are black and does not show in the photo above. After removing the screws I could take out the 2" eyepiece and input/screw the FF to the focuser.